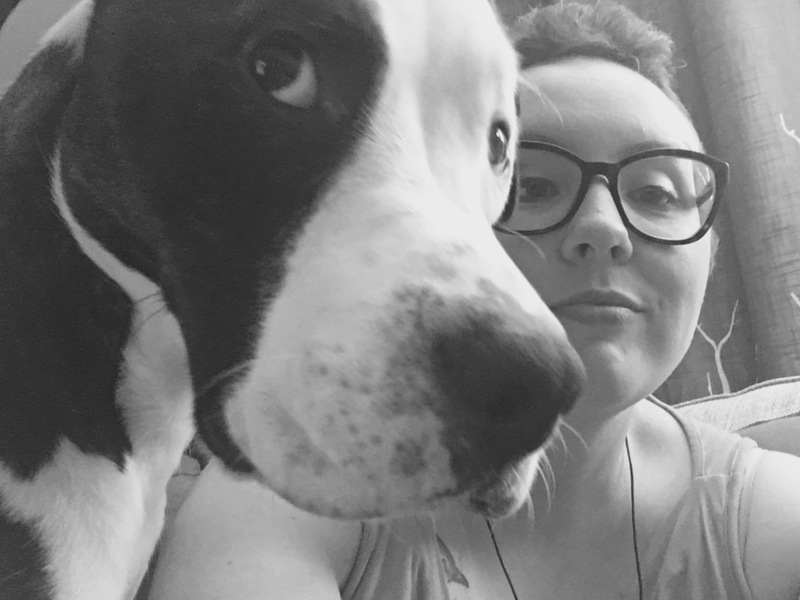 I've had dog joy on the brain lately, and I can't properly introduce this interview with poetry hero Emilia Phillips without noting her thoughts on it came at the right time. As I try to figure out what to do for my terminally ill dog Pete, Emilia's words are both a salve and a reminder: yes, our dogs pass through our lives too quickly, but they can teach you joy. And it can alter your life. 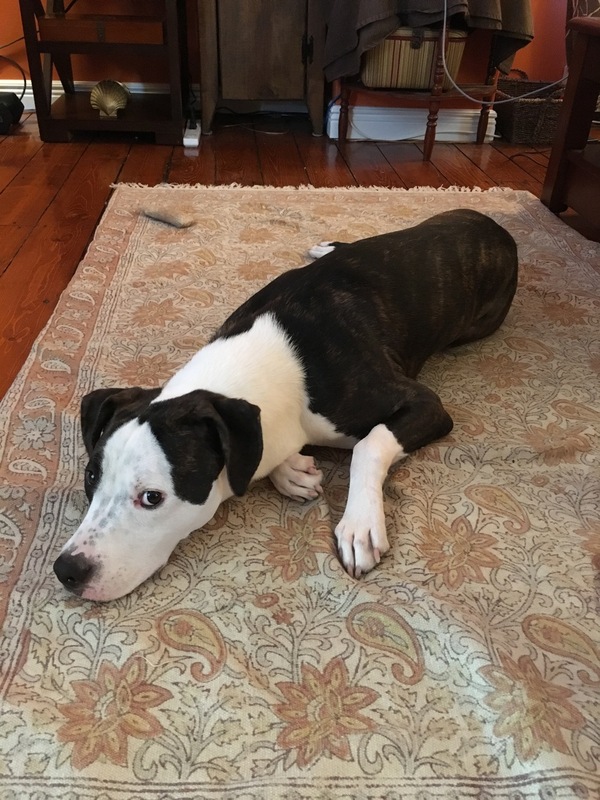 So let's bask in Emilia's insight on the wordless bond between her and her dog Grady, how his companionship prompts her to practice empathy, the humanness of dogs, and how to find an occasion of joy. If you haven't been fervently following Emilia's work (um, get on that), here's a little background: she is the author of two poetry collections from the University of Akron Press, Signaletics (2013) and Groundspeed (2016), and three chapbooks, most recently Beneath the Ice Fish Like Souls Look Alike (Bull City Press, 2015). Her poems and lyric essays appear in Agni, Boston Review, Gulf Coast, The Kenyon Review, New England Review, Ninth Letter, Ploughshares, Poem-a-Day, Poetry, Verse Daily, and elsewhere. She received StoryQuarterly’s 2015 Nonfiction Prize, The Journal’s 2012 Poetry Prize, as well as the 2013–2014 Emerging Writer Lectureship from Gettysburg College and fellowships from the Bread Loaf Writers’ Conference, The Kenyon Review Writers’ Workshop, U.S. Poets in Mexico, and Vermont Studio Center. She is the Assistant Professor of Creative Writing at Centenary University. She’s now at work on new poems, a collection of lyric essays titled Wound Revisions, and Offset: A Poetry Broadside Digitization Project. 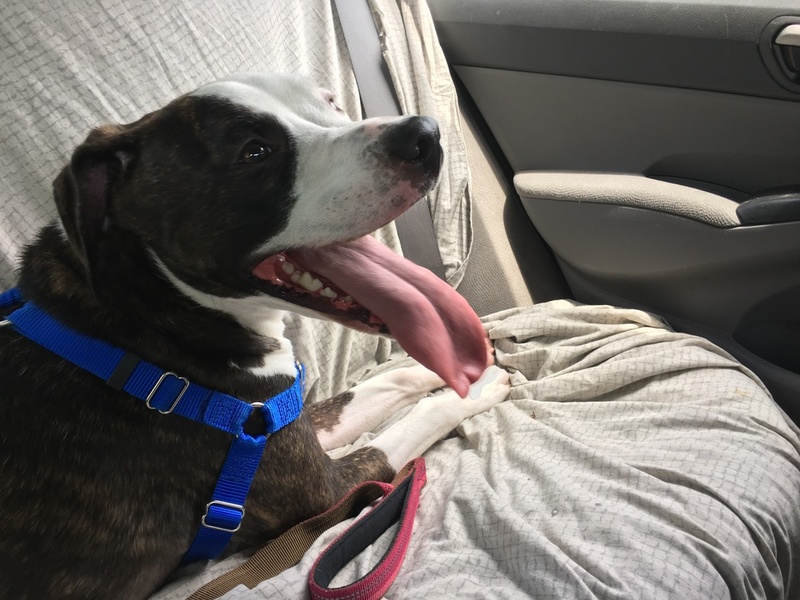 You noted you adopted Grady in 2015, and “he was born the same week in early January of that year that we had to put down my husband’s 15-year dog companion Phaeton.” I love that you noted that connection – did it affirm you and your husband made the right choice? Phaeton died the week of her birthday. We didn’t intend on getting another dog right away, but our other dog at the time, Percy, was beside himself with grief, and so our vet suggested that we get a puppy to accompany him. By the time we started looking for another dog, Grady was put up for adoption through a rescue group. We were already in love with Grady; he was goofy and shy and sweet. Then they said when he was born, and we knew he was right. You mentioned in our pre-interview chat that you don’t write much about Grady because “animals in past poems haven’t had the best fates.” Is this a similar notion to getting a tattoo of a lover’s name? That permanence – in poem or ink – invites doom? This may be a chicken and egg sort of thing. I’m not sure if poems themselves invite doom so much as doom invites poems. Because of my happiness in having a pet, I haven’t felt the need to write about having a pet. I admit: I don’t know how to make it interesting without loss. Maybe that’s something I need to continue working on. "I’m not sure if poems themselves invite doom so much as doom invites poems." I lean hard on my dogs for comfort. Has that been true for you? Can you talk a little about how profound that comfort can be when words fail? I certainly do. This summer, I have spent a great deal of time at home, and in a small town where I know no one else. Without Grady, I feel I would have gone crazy in my head. Additionally, he may not be able to speak words, but he’s the most talkative dog I know—he seems to want to speak. He vocalizes his wants. In some strange way, he makes an argument for the strength of a voice, even when words themselves fail. I recently read and loved your chapbook Bestiary of Gall (Sundress Publications, 2013), a collection of fables (many about animals) reimagined and recast in the contemporary, human mode. This is a world where the real – foxes and drones and carrier pigeons with incendiaries and war – feels surreal in its retelling. What was the impetus for this collection, and why are animals a natural vehicle for the violence, chaos, and majesty of this subject matter and experimental form? Sometimes I think the one-to-one equation between the realm of beasts and violence simplifies animals to their instincts. In this chapbook, I wanted to reckon with the notion that human violence demonstrates our species’ “animal” side; ultimately, I felt that wasn’t the case. I think animals of all kinds have lives and personalities beyond their instincts, and their instincts—even for violence—are natural. Human violence, I believe, is much more sinister than animal violence, but who’s to really say? We can never truly know what it’s like to be an animal, what an animal sees. "We can never truly know what it’s like to be an animal, what an animal sees." Let’s talk a little about the importance of acknowledging joy with poems (it’s harder than it seems, right?). Does Grady help you in this regard? It’s so hard to acknowledge joy in poems, and I’m so glad you saw this moment as joy. Grady—well, really, all the dogs I’ve ever had—give me ideas for occasions of joy. They lead by example. When I was a kid, I started riding with my head out the window because I saw my dogs do it, and I still do it occasionally because it feels so amazing. It allows for a moment in which all my human responsibilities blow away in the window, and my ears are filled with white noise, and I can just be in my body. Sometimes Grady just reminds me the joy of being in a body, to being a thing: to do, to run. This summer I have been taking Grady on long walks to an abandoned suburban tract. The lots without houses have grown up with shrubbery, and deer live there. I have spent some of the best moments of my entire summer standing with my dog at the edge of a tall thicket listening for something inside. Often we see deer, and there are orioles and blue birds that swoop over our heads. Sometimes we even venture back into the thickets, in a kind of young flowering grove. There, I am beyond myself, entirely focused on having a similar experience as he does. In some ways, I would say, having a dog makes me more adept at understanding the experience of another because Grady’s experience of the world is often so different than mine that when I try to imagine what his experience is, it closes the gap between my experience and those experiences of other people that are more like mine than his. "All the dogs I’ve ever had give me ideas for occasions of joy." You mentioned that Groundspeed’s poem “YouTube: Dog Eating a Human Leg on the Ganges” demonstrates “the way in which I embrace the animalness of a pet even as I talk and sing to my dog, personify him by lending him human emotion, and so on.” I think dogs are such an interesting case study for this – they are perhaps the most humanlike animal we interact with on a regular basis, and maybe that humanness is directly derived from the fact that they could turn on us, and we simply have to trust that they won’t. Do you think it’s this dynamic that makes dogs a ripe subject matter for poetry? Our last dog, Percy, had been severely abused and abandoned when he was an adolescent. The humane society found him chained up behind an abandoned house in Newport News with a chain growing into his neck. He was always a nervous dog, a little unpredictable, but when Phaeton died, he became so struck with grief that he was self-harming when he was left alone during the day. He began to chew his legs and paws until they were bleeding; he threw himself against the crate and walls. After Phaeton’s death, he suddenly became dog aggressive. One day, while a dog sitter was walking him, he got away from her and attacked a neighbor’s foster dog, and we had to pay for the surgery. Fortunately, Percy had broken a couple of his teeth earlier in his life and didn’t do that much damage. I took Percy into the vet, and they did behavioral assessments and put him on Prozac. As I mentioned before, the vet suggested that we get a puppy (Grady) to give him companionship. They felt that he would have the drive to take care of and bond with a puppy, and he did—until Grady became a full-grown dog. One Sunday, I was working in the kitchen and, without prompting, Percy ran in from the other room and attacked Grady. I couldn’t get him off of Grady, even though he didn’t even break the skin. I don’t know how long it was, but I finally got them away from one another and I dragged Percy to his crate. His eyes were like nothing I’d ever seen. He didn’t even look like himself; it was like he was possessed. After about fifteen minutes, his eyes softened and he began to whine. It was the saddest thing I’d ever seen. He was a liability, I knew, and I didn’t want Grady in danger. He never once acted aggressive toward a person, and even in that fight, he was gentle toward me. Still, I was suddenly afraid of him. That’s when I knew we had to put him down, and the vet agreed. I sobbed the whole time. He licked the tears from my chin as they injected him. He was eleven. For me, seeing that side of a dog come out was terrifying. It was like I’d been on the main line into Percy’s wildness. Of course, that line was opened by human abuse and trauma, something that never left him. The vet described it as PTSD, which had once again been triggered by the death of his companion. Once I heard that, it made me feel that, no, it wasn’t the animal I was seeing in him. I was seeing something essentially human, or what we know to be a human experience. That violence wasn’t animal; it was human. The humanness I see in Grady is altogether different. It’s non-violent. It’s talk, albeit wordless. It’s also his personality, his attention to emotion. So, I would say that the humanness of dogs is what attracts us to them, whether or not that humanness is good or bad. "The humanness of dogs is what attracts us to them, whether or not that humanness is good or bad." Shifting gears a little: for three years, you interviewed poets for the 32 Poems blog. What did being on the other side of the interviewing process teach you about engaging with other artists? Asking for a friend. One of the best takeaways I had from interviews is that the conversation often gives both the interviewer and the interviewee insights into the work at hand. When I’ve been interviewed, I often feel like I find out something about my work I didn’t know, and I had more than one interviewee express the same. The conversation and its capacity for mutual discovery helps fortify the notion that the poems have their own lives. You recently completed your third manuscript Empty Clip (congratulations!!). What’s next for you? Can I expect more animal poems? Thank you so much! I am working on some new poems for a possible new project, some of them really come out of the time I’ve spent without words in my summer with Grady. He’s already in some of the poems. Like a younger prince who never has to be king, he doesn’t care who’s watching.